Total cop-out post . . . or brilliance. I’ll let you decide. But if it’s cop-out, don’t tell me, coo? I don’t know what it is lately, if I’m subconsciously preppin’ for the after-school snacks era, or if my little leeches love pizza and tortillas and cheese just as much as I do, but you GUYZ. There ain’t no stop button on these. Do you want to punch me for using a z just now? I woke up from one of my precious (<—-ew) afternoon naps the other day with a flood of drool on my pillow and hot, crispy pizza rolls on the brain. STARVING. FAMISHED. WITHERING AWAY. 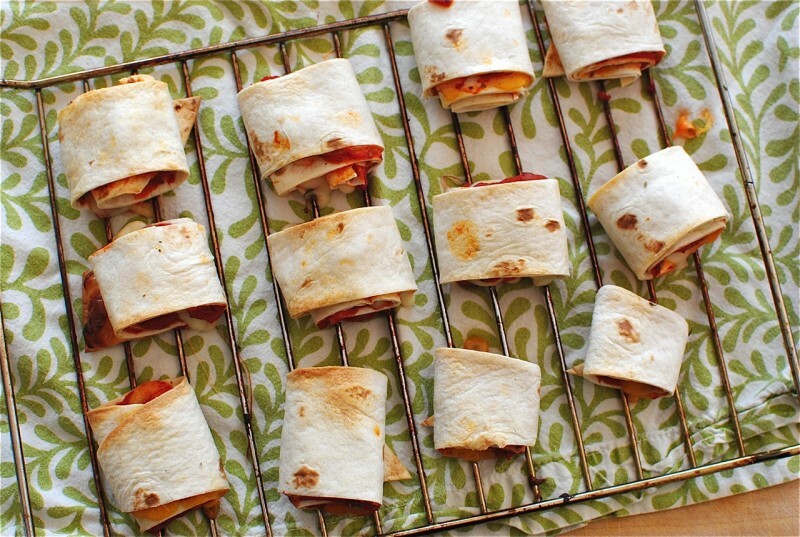 When I was a little, we used to eat those frozen pizza rolls, ya know? The ones in the bag, ya know? The ones you either toasted or microwaved, ya know? The ones filled with chemicals and acid and turpentine and were so yummy you thought about them ALL DAY LONG and couldn’t WAIT to get home and eat 47 billion and watch the Brady Bunch and then spend 30 minutes BUT NOT A SECOND MORE playing Nintendo before starting your homework? Ya know? I mean sure, these are white flour tortillas with a bunch of melty cheese in them (holla), but I’d like to believe they’re a few notches better for us than those awesome turpentine rolls. I had a bunch of low-fat string cheese left over from my early pregnato days, which are diddly dang PUUUFECT for slicing up and stickin’ in these here rollies. Do you want to paper cut me for saying rollies just now? 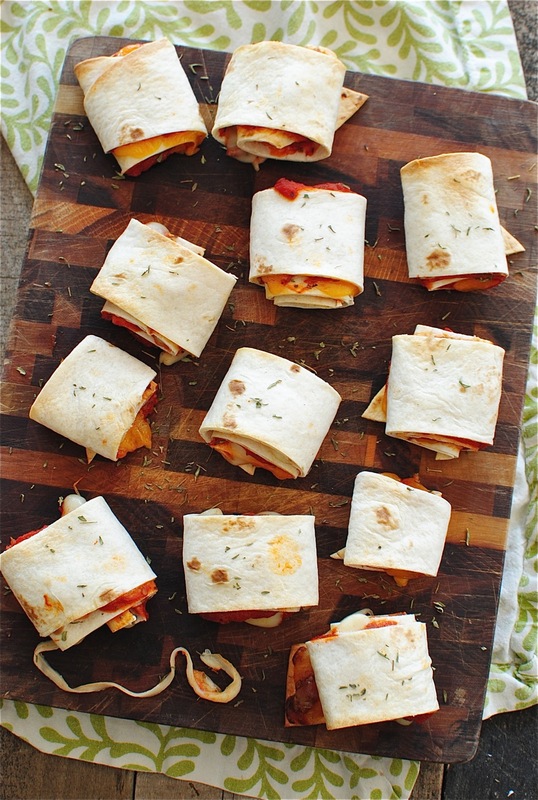 Use your favorite homemade or jarred pizza sauce, grab some simple or fancy or anything in between cheese, sprinkle with dried herbs, roll up some white, whole wheat, gluten-free WHAT HAVE YOU tortillas and toast up some freaking pizza rolls, duders. I miss the Brady Bunch. 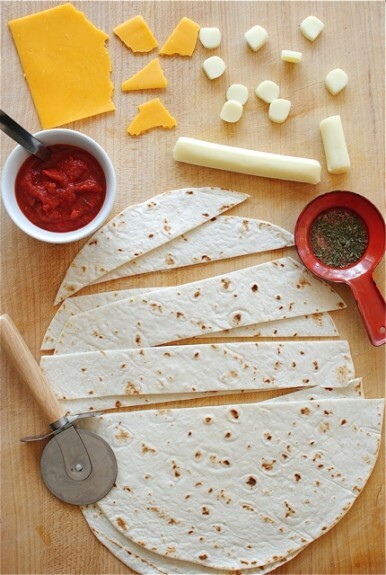 Using a pizza cutter, slice the tortillas into even strips. 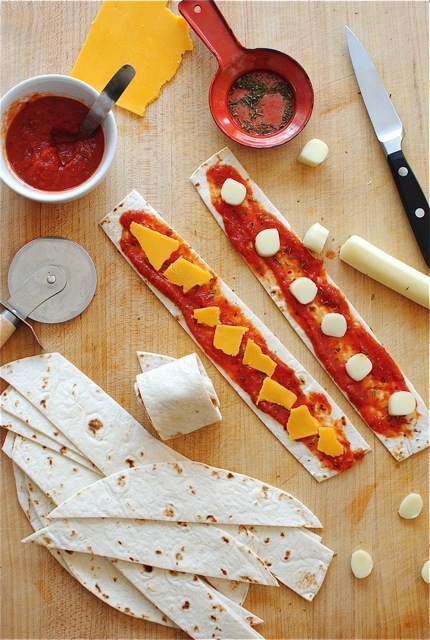 Evenly and lightly spread some pizza sauce along each strip. Top with cheese of choice and sprinkle with thyme. Roll up into little . . . well, rolls. Pop in the toaster oven seam-side down for about 5 minutes. Maybe 7. Just keep an eye on them until they’re browned on top and crispy, and the cheese is melted and oozing out and singing “Love is a Many-Splendored Thing” to you. options: pesto with tiny chicken chunks, any leftover sauce you have in the fridge like alfredo or creamy tomato, thinly sliced ham, whole wheat tortillas, gluten-free tortillas, fresh herbs, go CRAY. Do you want to body slam me for saying cray just now? Heck yes!! 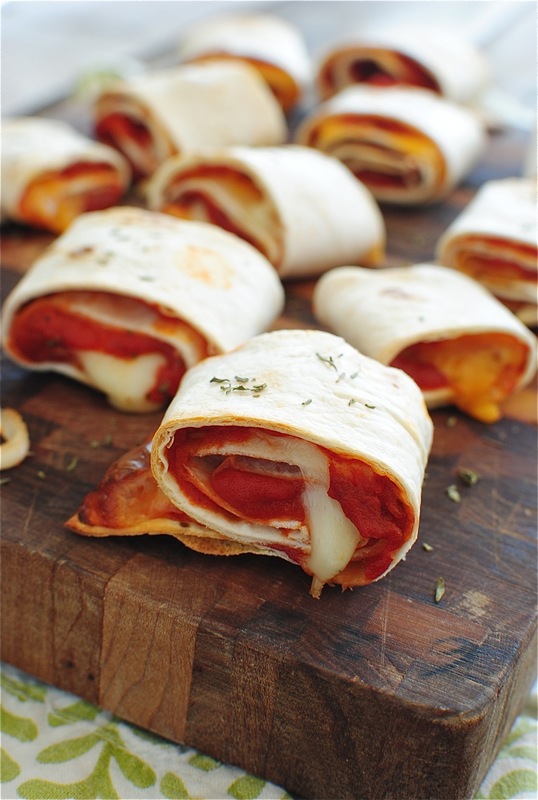 Pizza rolls rule. Everyone loves them and they are perfect anytime of the day! This is a great idea! It can also be made by rolling up the ingredients in a tortilla and frying on the stovetop with a little cooking spray and then cutting it into pieces...I love the melted cheese!! 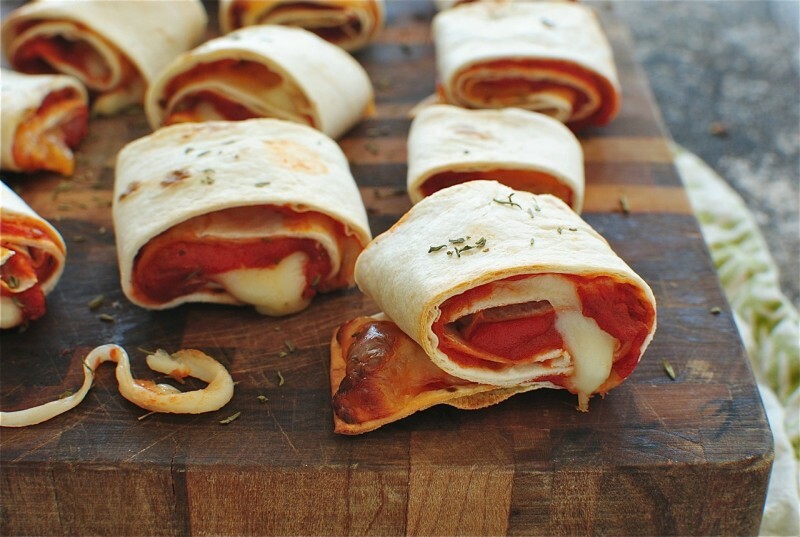 I wish I didn't know the real-deal-pizza-rolls were SOOOoooo bad for me, because I would still eat them. But now I have these. You are my hero. Oh my gosh, these are going to make my hubby soooo happy. He was complaining the other day that he misses those frozen and so bad for you pizza rolls....now he has these. Thanks for giving me some hubby brownie points! Gimme dem rollie pollie pizzaoles!! I'm a total sucker for a good old fashioned pizza roll. These looks fabulous! I think I might just love you! 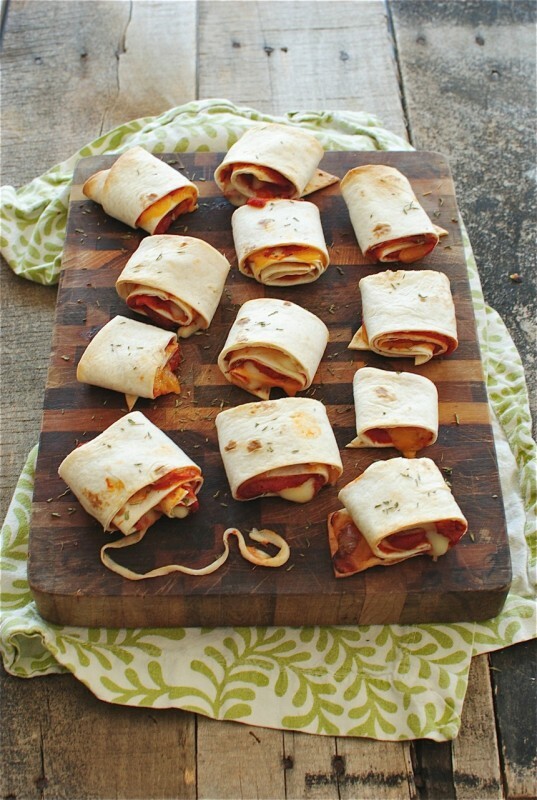 I'm gluten intolerant & I really miss my pizza roll thingys. You have blessed me today! Thank you, thank you, thank you. These are the perfect after-work snack. Oh, these will be made. So simple! And definitely delicious looking - love! Ok it's official...you are going to be the cutest mom on the planet!! I want 32,394.45 of these right now. We still eat those frozen pizza rolls. But these look way better!! So adorable and what a creative idea! My daughter would love to help make these! Yuuuuum. The ease of these only makes them even more appetizing to me! Dude, I could totally eat 4, 563 of those old school pizza rolls. I am so thankful you've made a healthier version!! This is so the PERFECT afternoon snack. Would be in heaven if I had these at my desk right now! oooh baby. can we come over for after school (after nap?) snacks sometime? Cop-out? NO WAY! Total genius-ness (new word), Bev! I made pizza rolls once but they definitely didn't look as wonderful as these. I could eat all 12 if I really let myself... so good! After work snack? I say yes please! Thank you, these look excellent for the little ones who like to eat on the RUN! I don't have a toaster oven, how would I cook them in the oven? Hey, Christina! I'd say just bake them on a little tray or baking sheet in your oven at 350 for maybe 8 to 10 minutes? Something like that! 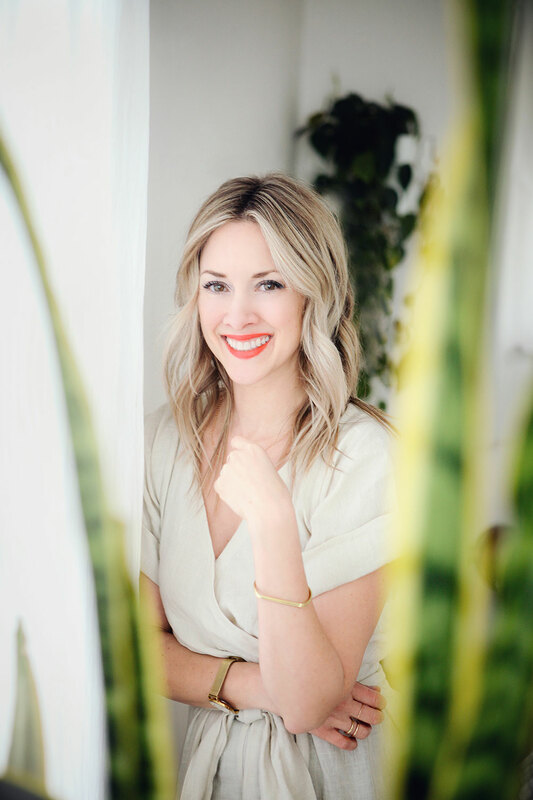 such as binaural cartier become prominent among the sports athletes, businesses, and the ones performing to their private improvement additionally religious head condition. These are typically widely used all over the world concerning meditation and as an effective to Easy technique on bypass the actual aware mind and also function straight with the subconscious. Within the last couple of years they have become more well known. Home made pizza are the pick of all the cited for me. I would try to make it because i know this would be my first attempt . Seems yummy to me in the pictures. Can't resist. Thanks a ton. I've been making tortilla pizzas since I was a kid. I sometimes roll them up after cooking them and eat them like that. This looks like fun for the kids. Your writing is hilarious! I say the same things. Your rolls were perrrrrfect! P.S. Sometimes Anonymous replies are just mean people that like to bully and most likely have low self esteem. Move along, move along. How can something so simple be SO DELICIOUS?! These were fabulous. My 5 year old kept saying "I like dinner, Mama." Something my kids can make!! This is delicious!!!! Love it. Yummy. I wasn’t thinking of body slamming you, but if you want. Crazy, huh?